In order to make the introduction of a new stove as transparent as possible here is an update on what is going on so far. We finished the moulds (about 60) for forming the MCS body in a Jigger Jolly (or jigger as some call it). We made a few moulds for the grate but as there is a plan to immediately change it's tooling we are not making too many of them. In a trial run last week Ceramic Arte (Lda) run by Gilberto Manjate, they made 650 stove bodies. The grates are relatvely easy to make as the turn around time for the mould is less than 2 hrs. It was the body that was the worry. As the present target is to sell 500 a month that was a good exercise. The body is moulded with the process reported earlier. The moulds are set aside to try a little and the body drops out (gently). The stubs upon which the grate sits are added immediately by inverting the body over a tool that serves to guide the process. All the little wings, called grate rests, are added by hand - 5 of them. There are 5 because if one breaks off (which has not been a problem) the stove remains fully functional. If a second one breaks off there is a 50:50 chance that it will still be fully functional. If there were only 3 the grate would drop out if one was broken off. The stoves and grates can be fired together as long as the grate is not sitting in the stove (they melt together if you do that). The grate is placed upside down on the shelf in the kiln and the stove placed over it. They don't touch at all. The small kilns hold 28 sets each. The firing is dont to 120 degrees to dry them for 90 minutes, then taken to 600 where they are held for 3 hours with air admitted. This burns out the charcoal that makes the walls porus. The stoves are then heated to 950 relatively quickly then 65 degrees per hour to 1170 and held for 3 hours. This hold is mailny to get an even temperatures throughout the kiln which has been a problem. Then they are transformed into a low thermal expansion material and can be cooled quite qickly - about 3 tiems faster than regular clay products. Normally the kiln shuts off and it cools naturally. At 200 degrees the door can be opened, they are unloaded and new ones put in immediately. This process has a firing sequence of less than 24 hours but at the moment once per day is adequate. We bought a moisture balance to get the water content of hte materials being mixed. The mass of the added components has to be compensated for moisture content to get the chemistry right. This simple device heats a small sample (up to 50 gm) to a preset temperature (140 in our case) and tells you the moisture content in %. It is really easy to use and gives an incredibly accurate result. The PK11 mix is still being done with a spade on a floor. This will be changed when a dry mixer is made. 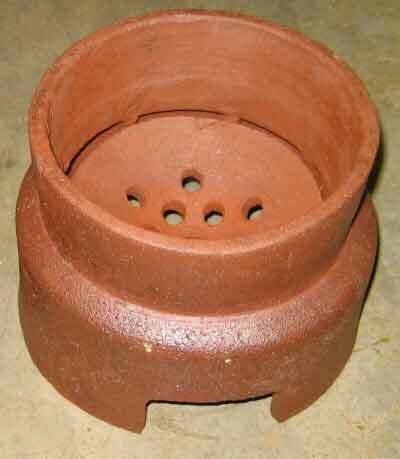 The pot supports can be made from clay (very cheap but slow to make) or welded metal (expensive) or stamped, folded stainless sheet (cheap). As mentioned in a separate post, a charcoal drying bin can be placed on the stove, as can a water heater, oven etc. so the pot rests have to be removable (also to change or clean the grate). With the present equipment we can make 1500 stoves a month on a single shift, the uper limit being oven capacity. When we start using the larger over (there are three) we can produce 160 a day on a single firing (i.e. without chaining the firings back to back as fast as possible). The first 500 stoves are now being test marketed. Dozens of people turn up each week trying to buy the stoves (which have not been available in quantity) having seen them at the market or in someone's home. Consistent reports come back that it cooks faster than the traditional metal stove and the saving is over 50%. That will be proven using the baseline in comparative controlled cooking tests. We have 36 paired samples which according to Dr Kirk is a very large data set for that type of meaasurement. Lab tests are also used to make comparisons. The results are encouraging but I will leave it at that. The implementation plan is to get the production up to 6000 stoves per month during the coming 11 months. An extruder specifically set aside for thrashing the mix before moulding (to avoid contamination from other clays) is being sourced. We are happiest that after may stove melts we now get 56 perfect stoves per day from the small kilns (total). Because we are running the kiln very close to the melting temperature, the slow ramping at the top end is critical. These temperatures are achievable in a Hoffman kiln, but the skill to do so is not present at this time in Maputo. For the moment we are going to use electricity or gas. At the present time, the pay-back period for a stove purchaser is about 3 weeks. The stove repays its energy input in something like 3 days I think. I will check on that. It takes 4 KWH + the charcoal needed for making it porus (about 400 gm).